I was thinking last week about all of the types of cupcakes I want to make... the list keeps growing! 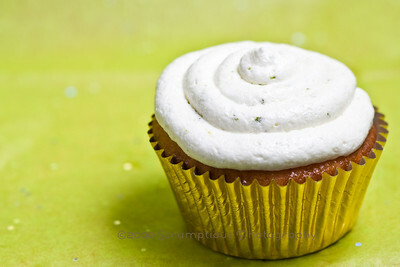 I had too many recipes to choose from, so I made A. choose, and mojito cupcakes were his top pick. Note: I got 24 regular cupcakes and 15 mini cupcakes out of this recipe, and still had a little bit of batter left over. Check the linked recipe for other baking options. The frosted cupcakes should be stored in the refrigerator and will keep for a few days. The unfrosted cupcakes or cake can be stored, well-covered, at room temperature and will stay fresh for a few days. Preheat the oven to 325 degrees F. Place a rack in the center of the oven. Set up your cooking vessel (muffin/mini muffin pan, baking cups, loaf pan, bundt pan... etc.!) I use nonstick spray with oil and flour (Baker's Joy or Pam for baking). Combine the buttermilk, rum and vanilla extract. Set aside. Combine the flour, baking powder, baking soda and salt. Sift and then set aside. In the bowl of a stand mixer, fitted with the paddle attachment, combine the butter and sugar. Mix on medium-high speed until light and fluffy (about 4 to 5 minutes). With the mixer still on low speed, add 1/3 of the dry ingredients and mix well. Add half of the buttermilk mixture and mix well, scraping down the sides of the bowl if necessary. Mix for a minute or two. Add another third of the dry ingredients (on low speed) and mix well. Add the remainder of the buttermilk mixture, once again scraping down the sides of the bowl if necessary. Mix for another minute or two. Add the remainder of the dry ingredients (on low speed) and mix for a minute or two, until the batter is smooth. Scrape down the sides of the bowl to ensure that all of the flour has been incorporated. Fill the mini party cupcakes halfway with batter until you’ve used it all up. If you’re only making 30 mini cupcakes, then fill the 30 cups and pour the rest of the batter into the loaf pan. Bake the mini cupcakes for 25 minutes and then test for doneness by inserting a cake tester into the centre of the cupcakes. If it comes out clean, they’re done. If not, bake for another 5 minutes. In my oven, the mini cupcakes took about 28 minutes. If you’re also baking the loaf, that will require more time. In my oven, the loaf took about 50 minutes. Remove the cupcakes from the oven and let cook for 5 minutes before poking holes in them with a skewer or toothpick. Immediately spoon the rum syrup over the warm cupcakes and let them soak it all up. Once they’ve cooled completely, you can ice them with the lime and rum frosting. In a small pot, combine the sugar, water and butter over medium-high heat. Bring the mixture to a boil, stirring often. Once the butter has completely melted and the sugar has dissolved, remove from the heat. Carefully add the rum. The mixture will bubble and spurt so take care not to burn yourself. Once you’ve mixed in all the rum, add the lime zest and mint and let the syrup infuse for 5 minutes before spooning over the cupcakes. In the bowl of a stand mixer, fitted with the paddle attachment, combine the cream cheese and butter at high speed for 5 minutes. Reduce the speed to low and add the icing sugar. Mix for a minute to incorporate the sugar and then increase the speed to high again and mix for another minute or two. The frosting should be light and fluffy. Turn off the mixer and scrape down the sides of the bowl. Add the rum and the lime zest and mix at medium speed until well incorporated. The frosting should be used immediately so make it once your cupcakes have soaked up the syrup and are cool. You can spoon the icing on with an offset spatula or knife, or you can use a piping bag to pipe a pretty design. Such pretty cupcakes! I absolutely adore mojitos, so I may have to try these. 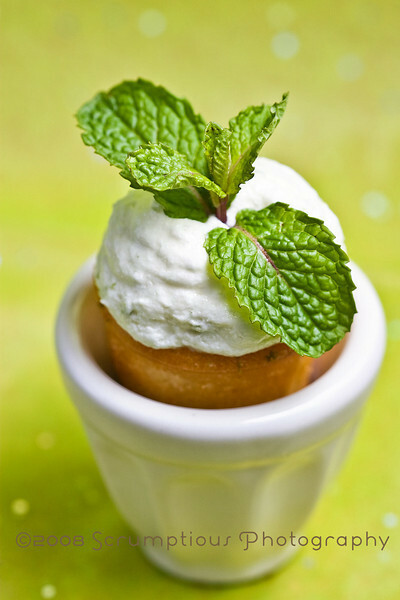 You should try adding some lime zest and finely chopped fresh mint into the batter, too. I've been making my own mojito cupcakes for a couple summers now and it's nice to get the light lime and mint flavour in the cake instead of just in the icing. There's no way mine look even half as nice as yours, though! I applaud your beautiful styling and photography!